Since 1984, The Life Extension Foundation has battled against the high-cost of prescription drugs. We long ago predicted that a health care cost crisis would erupt if Congress did not reign in the artificially inflated prices that Americans pay for their prescription medications. To expose the incestuous relationship that exists between the FDA and the pharmaceutical giants, we made hundreds of appearances on TV and radio shows, mailed out millions of pieces of mail, ran full-page newspaper ads and set up anti-FDA web sites. We did this for the purpose of encouraging consumers to act-up against blatant corruption that is bankrupting the nation's healthcare system. Some people ask why our scientific organization, whose mission is to discover novel methods of preventing disease and controlling aging, is so concerned about prescription drug costs. The most compelling reason is that seriously ill people join The Life Extension Foundation seeking our medical expertise. Far too often, the elaborate drug cocktails we recommend to combat their disease are cost-prohibitive. Insurance companies frequently refuse to pay for our drug recommendations because the FDA does not officially sanction them. While the individual drugs we recommend may be FDA-approved, the agency does not recognize the off-label benefits these drugs can provide. Insurance companies then use the FDA's non-recognition as an excuse to deny coverage. There is no inherent reason why prescription drugs cost so much. The identical medications can be purchased in Europe and Canada at far lower prices. This price gouging has going on since as early as 1959. The trouble is that the FDA has attempted to deceive Congress into believing that drugs from other countries are counterfeit or contaminated. Life Extension has shown that the FDA's assertions are baseless, false and misleading. We need to be able to make a blanket assessment that these things are not safe for American consumers and should be turned back. In response to the FDA's assertions, Life Extension sent Freedom of Information Act (FOIA) requests in June 2001 asking the FDA to substantiate their sworn testimony before Congress that drugs imported from other countries were dangerous. Even though the FDA is legally mandated to respond to Freedom of Information Act requests, they have ignored our repeated written requests and phone calls to substantiate their sworn testimony about the supposed dangers of imported medications. In 1991, Life Extension sued the FDA for failing to respond to Freedom of Information Act (FOIA) requests dealing with this same issue. The FDA capitulated on this lawsuit and had to turn over embarrassing records to Life Extension. Despite the FDA being forced to turn over documents to Life Extension in 1991, the FDA continues to ignore our legitimate requests to substantiate sworn testimony made to Congress that imported drugs are dangerous. When the FDA told Congress that drugs imported from other countries are not safe, they provided no evidence to substantiate this intimidating allegation. The fact that no one asked the FDA to validate their baseless assertion is an indication of official apathy and the effects of massive influence peddling by pharmaceutical giants. Congress created The Freedom of Information Act (FOIA) to make government information and documents public knowledge. FOIA was enacted in 1966 and amended in 1974. * The purpose of FOIA was to make Federal agencies accountable for their actions and to keep those agencies working within the limits of the law. FOIA is supposed to provide a key to government file cabinets so that all citizens can scrutinize Federal agencies. The reality has been that agencies routinely break the law by ignoring FOIA requests altogether. In other instances, the agencies use loopholes (exemptions) to not respond to inquiries that could prove embarrassing to the government or uncover criminal wrongdoing (such as perjury before Congress). A popular government, without popular information, or the means of acquiring it, is but a Prologue to a Farce or a Tragedy-or perhaps both. Knowledge will forever govern ignorance, and a people who mean to be their own Governors must arm themselves with the power which knowledge gives. Freedom of Information Act Guide, May 2002. Life Extension has meticulously exposed the charade of prescription drug pricing on the web site www.stopfda.org. Drug price comparison charts published in Life Extension magazine have been enlarged for presentation on the House floor to show Representatives how much more Americans pay for prescription drugs compared to Canadians and Europeans. Despite lobbying efforts by the pharmaceutical industry, the Senate passed a bill by a vote of 69 to 30 on July 17, 2002 that would allow licensed pharmacists and drug wholesalers to import drugs that have been approved by the FDA from Canada. Large pharmaceutical companies are determined to use their political influence to block passage of this bill in the House of Representatives. The New York Times reports that even if a drug importation bill is passed, the Bush Administration will refuse to carry out the provisions, thereby denying Americans access to lower cost medications. In December 2000, the Clinton Administration blocked implementation of a similar bill passed by the House and Senate that permitted Americans to import lower cost medications from other countries. Life Extension members should appreciate the enormity of the battle being waged against a drug cartel that is determined to protect its monopoly. Drug companies work hand-in-hand with the FDA to force Americans to pay the highest prices in the world for their medications. The number one issue before Congress today is the high cost of prescription drugs. Consumers have besieged Congress with complaints that drugs their doctors say are necessary to keep them alive are unaffordable. Several bills were debated this summer in Congress that would appropriate tax dollars to subsidize prescription drug programs. The problem is that the cost of drugs has become so enormous, that even the Federal government cannot figure out how to fund the gargantuan expense. The debate involved spending between 370 and 564 billion tax dollars over the next 10 years on drug subsidies. These proposals would not solve the problem, but do shift some of the burden from consumers to taxpayers. Since most drug consumers are also taxpayers, Congress was essentially proposing to take more tax dollars from American citizens in order to subsidize the artificially inflated prices of their prescription drugs. That means that the true beneficiary of the bills debated in Congress would have been the drug industry, which would have pocketed enormous profits directly from consumers, insurance companies and the Federal government. Another problem with tax dollars being used to pay for prescription drugs is the inevitable waste, mismanagement and fraud that occurs when government bureaucracies try to regulate the marketplace. The Federal government has had to litigate against large drug companies after finding that Medicare and Medicaid sharply overpaid for dozens of drugs. Government officials have sought billions of dollars in restitution based on their contention that drug companies induced Medicare and Medicaid to pay inflated prices for prescription medications. Since this is an election year, everyone in Congress tried to show their constituents that they want to make prescription drugs affordable. The problem is that it is impossible to circumvent the catastrophic effects that the current FDA-protected drug monopoly creates. In the first place, there are no surplus tax dollars available to fund these proposed programs, meaning the government will go deeper into debt to fund them. Secondly, the proposed bills would not have sufficiently lowered the price of prescription drugs to the consumer. By July 31, 2002, Congress rejected the proposed drug subsidy bills and the issue is not expected to be raised before the fall elections. Two years ago, Congress passed legislation to allow Americans to import wholesale quantities of lower-cost prescription drugs into the United States. But the promise of this legislation has gone unfulfilled. Even though the FDA largely wrote the bill, and Congress provided the $23 million the FDA requested to implement the bill, then-Secretary Shalala refused to implement the measure. The result? Drug prices in Europe and elsewhere are still 30% to 300% lower than in the United States. Prices have not equalized. Americans still pay the highest prices in the world to subsidize the "starving Swiss." Even former-Secretary Shalala admits this fact. But that's not all. The FDA refuses not only to allow wholesale importation, the FDA also maintains that personal importation is illegal. Yet, because the market for lower-cost drugs is so large, the FDA looks the other way when people import personal-use quantities of prescription drugs. That's right: the FDA today allows folks to carry drugs over the border, and apparently now even allows [them] to mail order drugs from abroad. Yet all the while, the FDA publicly maintains such importation is illegal, thus threatening importers with dire legal consequences. This is wrong. The FDA can't have it both ways. Either personal use importation is illegal, or it's not. Last year, by a vote of 324 to 101, the House passed language explicitly allowing individual Americans to import lower-cost FDA-approved drugs from FDA-approved facilities. This is common sense, and it is the FDA's current policy. Unfortunately the Senate refused to pass this amendment, so the FDA continues to hold a legal dagger over the heads of those who try to import FDA-approved drugs. Fortunately, with the House drug coverage bill coming to the floor soon, we have an opportunity to codify current FDA practice, AND allow our nation's pharmacists to offer the same drugs. With this, all Americans can be sure they have the right to save money on their prescription drugs. The Congressional Budget Office estimates prescription drugs will cost Medicare beneficiaries $1.8 trillion over the next 10 years. Americans could save $630 billion from this bill if they could be allowed access to the same drugs from FDA-approved facilities throughout the world. Price, not coverage, is the real prescription drug problem. The FDA should not stand between American consumers and lower drug prices. The Gutknecht Amendment (H.R. 5186) prohibits the FDA from blocking importation by individuals and pharmacies of FDA-approved prescription drugs from FDA-approved facilities. Do you ever wonder how much it costs a drug company to obtain the active ingredient in a prescription medication? Life Extension did a search of offshore chemical synthesizers that supply the active ingredients found in drugs approved by the FDA. A significant percentage of drugs sold in the United States contain active ingredients that are actually synthesized in other countries. Drug companies import these active ingredients into the United States where they wind up in the expensive drugs you buy at the local pharmacy. While the FDA says you cannot trust drugs from other countries, the facts are that most of the drugs sold in the United States contain active ingredients synthesized in the very countries the FDA says you cannot trust. In our independent investigation of how much profit drug companies really make, we obtained the actual price of active ingredients used in some of the most popular drugs sold in America. The chart to the right speaks for itself. The astounding profit margin enjoyed by drug companies exposes several facts. First, it shows why the pharmaceutical industry is the most profitable of all businesses. But since large drug companies only make around 15% net profit margins, it also exposes the incredible cost drug companies bear to comply with today's burdensome drug approval system. 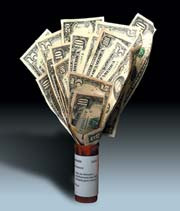 * If the FDA relaxed its drug approval standards, the cost of bringing new patented drugs could be reduced. Many consumers are nervous about the FDA becoming less stringent, but the facts are that today's regulatory system is allowing lethal drugs on the marketplace and also acting as a disincentive for drug companies to develop novel drugs to save lives. Take the cholesterol-lowering drug Baychol, for example, which was removed from the market after killing 100 people. *** Baychol is a statin drug that works via a mechanism similar to that in Mevacor, Zocor, Lipitor, Pravachol, etc. Was there a need for tens of millions of dollars to be spent developing another statin drug? Drug companies think so, because the FDA readily recognizes statin drugs, so they are easy to get approved. The problem is that no life was saved because of Baychol. Anyone who may have benefitted from Baychol could have obtained the same results from other statin drugs. So when drug companies justify the high price of drugs because of research costs, remember that most of the so-called novel compounds they develop will not save a single life, as they are no different than what is already available. Now that you know the outrageous profit margins on prescription drugs, you can understand why drug companies do almost anything to prevent competition from developing. Large drug companies intensely lobby Congress to pass laws that give them extra time of exclusivity, file lawsuits to delay generic competition, petition the FDA to stop the importation of lower cost medications, and go as far as to pay off generic companies to not compete. Drug companies spend big dollars protecting their illicit monopoly, all of which is reflected in the price consumers pay for their prescription drugs. * https://senrs.com/a_prescription_for_profit.htm By STEPHEN S. HALL Claritin and Schering-Plough: A Prescription for Profit. ** David Willman, The Rise and Fall of the Killer Drug Rezulin, Life Extension magazine, September 2000. The Gutknecht Amendment provides Americans access to FDA-approved prescription drugs made in FDA-approved facilities at world market prices. Passage of this amendment could abolish high prices of prescription drugs forever. While drugs sold in Europe and Canada do cost less than their American counterparts, they are still artificially high because of regulations in these other countries that stifle competition. If Americans are allowed to freely import prescription drugs from FDA-approved manufacturing facilities in other countries, there will be a surge of new laboratories that will seek FDA-certification. The result will be a flood of super low-cost drugs into the United States as various FDA-certified laboratories compete fiercely on quality and price. When Congressional leaders debate the prescription drug cost crisis, few of them understand the huge discrepancy that exists between the cost of the active drug ingredient compared to the price charged for the brand name or generic drug. For instance, consumers pay $360.00 for 100 capsules of the stomach-acid suppressing drug Prilosec. The cost of the active ingredient for 100 capsules of Prilosec, however, is only 52 cents. There will soon be a generic version of Prilosec available, but because of FDA over-regulation, the cost per 100 capsules will probably be around $80.00. In a free market environment, where many companies could offer generic Prilosec products instead of the chosen few anointed by the FDA, a product whose active ingredient costs 52 cents (like Prilosec) would be available to consumers for under $7.00 a bottle. A free market environment would eliminate the prescription drug cost crisis because the FDA would not be allowed to protect a monopoly that enables both brand name and generic companies to charge extortionist prices for lifesaving medications. Drug company lobbyists are inundating Congress to prevent any type of prescription drug importation bill from becoming law. Consumer groups are intimidated by the FDA's baseless assertions that imported drugs are somehow dangerous. The FDA has preyed on fear and uncertainty for decades, while American consumers are extorted into paying the highest prices in the world for their prescription drugs. This is not just an issue for individuals to be concerned with. There are dire predictions of severe economic upheavals in the United States if a solution is not found for the high cost of prescription drugs. Some of the largest corporations in America cannot afford to fund health insurance benefits for current and retired employees. Health insurance companies are going bankrupt because of astronomical drug prices. Medicare itself is predicted to be insolvent as soon as 2007. The United States has been economically deteriorating as prescription drug prices skyrocket. In order to counter the influence peddling of the pharmaceutical behemoths, American consumers must become politically active. Consumers vastly outnumber drug industry lobbyists. Regrettably, ignorance and apathy have silenced many Americans and enabled drug money to create laws that favor outlandish pharmaceutical company profits at the expense of the consumer. I encourage every patriotic American to enlighten their Congressional Representative about the need to support the Gutknecht Amendment to the 2002 Medicare Drug Coverage Bill, (H.R. 5186). If the Gutknecht Amendment is passed, it will liberate the American consumer from becoming an economic serf to the pharmaceutical cartel. At the bottom of this page is a form letter that can be mailed or faxed to your Congressional Representative. FDA reform is crucial because our very lives and economic survival are at stake. America is facing a nationwide economic healthcare crisis because FDA policies are denying citizens access to lower cost medications sold in other countries. We are asking all Foundation members to send the letter that appears on the next page to their Congressional Representative. 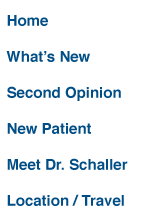 This letter urges members of Congress to pass the Gutknecht Amendment to the 2002 Medicare Drug Coverage Bill, (H.R. 5186). If this bill is passed into law, the cost of many prescription drugs will be drastically reduced. Corrupt bureaucracies will trample basic human rights as long as the citizenry remains passive and apathetic. Please sign the letter on the next page and mail it to your Congressional Representative. To find your Congressional Representatives, call the U.S. Capitol Switchboard at 1-202-225-3121. If you want to discuss this with your Congressman, you can be connected to his office directly. The high cost of prescription drugs is bankrupting the healthcare system of the United States. The only way of resolving this problem is to allow free market forces to compete for my business. I ask that you support the Gutknecht Amendment to the 2002 Medicare Drug Coverage Bill, (H.R. 5186). This amendment would allow pharmacies, drug wholesalers and individuals to purchase prescription drugs from FDA-certified manufacturers in other countries. I know pharmaceutical companies are lobbying against allowing consumers to obtain their medications from Canada and Europe, but I ask that you consider the welfare of your constituents who can no longer afford to bear the artificially inflated costs levied by the pharmaceutical companies. Please do not believe drug company and FDA propaganda that medications sold in Canada and Europe are somehow dangerous. This charade has been perpetrated for the purpose of maintaining the quasi-monopoly that forces Americans to pay the highest prices in the world for their prescription drugs. I don't want my tax dollars used to further line the pockets of the drug companies. I therefore ask that you vote against any legislation that calls for taxpayers to subsidize the artificial high prices of prescription drugs. If Americans are free to purchase their drugs from other countries, prescription drug prices will plummet, thereby mitigating the need for tax dollars to be taken from consumers to pay for their prescription drugs. The pharmaceutical industry pretends to use its profits to support research, but the facts are that most drug company research is aimed at developing patented molecules that are often no better than existing drugs. These patented molecules enable pharmaceutical companies to reap enormous profits, without providing any kind of medical breakthrough. For factual information relating to the prescription drug cost crisis this nation faces, log on to the web site, www.stopfda.org. Please vote for the Gutknecht Amendment to the 2002 Medicare Drug Coverage Bill, (H.R. 5186 ). I request that you write me concerning your position on this vital issue. DR SCHALLER NEITHER SUPOORTS NOR OPPOSES THIS MATERIAL. READERS ARE INVITED TO GO TO THE FDA WEB SITE FOR THEIR POSITION. DR. SCHALLER CANNOT CONFIRM THE ACCURACY OF ANY THIRD PARTY ARTICLE. THE FDA WEBSITE IS WWW.FDA.GOV. 1. "We Need an FDA Leader, Not a Regulatory Czar Health Care: AIDS, cancer and Alzheimer's are among the issues where David Kessler has compromised science and ethics." The Los Angeles Times (Pre-1997 Fulltext), Feb 10, 1993. 6. "What's New About Prescription. . .", by Morton Mintz. Washington Post, Page B1, February 11, 2001. 7. "Drugs The FDA Says You Can't Have," Life Extension magazine, July 2001. 10. "Thursday Plan to Import Drugs From Canada Passes In Senate, but Bush Declines to Carry It Out," by Robert Pear. Late Edition, Final, Section A, Page 14, Column 4. New York Times National Desk, July 18, 2002.